The bishops of Cuba have given President Raúl Castro Ruz their "vote of confidence." Raúl Castro was elected the country's new leader on Sunday, replacing his brother Fidel Castro. The elder Castro ruled Cuba for nearly 50 years. The bishops stated, "At this time our prayer goes up to the Lord and to Our Lady of Charity, our Mother, patroness of Cuba, so that" the president and Parliament "would have the light of the Almighty to carry out with determination those transcendent measures that we know must be gradual, but which can satisfy the longings and worries expressed by Cubans." "As we did at Christmas," continued the statement, "we want to renew our vote of confidence, and with Christian hope, formulate these desires to the new President Raúl Castro Ruz, [...] having always before our eyes the common good of the Cuban people whom we serve, and asking our Lord for the gift of peace for our nation." The new president will have his first diplomatic encounter Tuesday, when he meets the Pope's secretary of state, Cardinal Tarciscio Bertone. The cardinal said today he expected "clarity" and "sincerity" in his talks with the new leader. "I have come here at a special, extraordinary moment," he told a joint news conference with Cuban Foreign Minister Felipe Perez Roque. 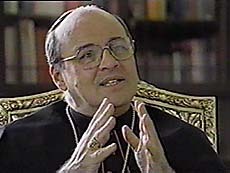 Cardinal Bertone is in Cuba until Tuesday. His visit marks the 10th anniversary of Pope John Paul II's trip to the island nation in 1988.